And happy thinking. Check out Senator Elizabeth Warren’s speech on industry consolidation and concentration, including what is happening in the food industry. Thanks to Courtney Scott, a doctoral student at University of North Carolina, for sending me this account of the fate of Britain’s salt reduction strategies, published in the BMJ (British Medical Journal). The lead author on the article is Dr. Graham MacGregor, Britain’s leading advocate for diets lower in salt. It is about the derailing of Britain’s remarkable successful salt reduction strategy. Under the auspices of Britain’s Food Standards Agency (FSA), the salt reduction program initiated in the early 2000s—getting companies to slowly but steadily reduce the salt in their products—was working well. Most impressive: salt intake, blood pressure, heart disease, and stroke declined in parallel with the decline in salt in the food supply. But in 2010, Britain elected a more conservative government. Andrew Lansley was appointed secretary of state for health, and he moved the responsibility for nutrition from the FSA to the Department of Health. This disrupted the salt reduction programme, making it unclear who would be responsible for the policy. In 2011 Lansley launched the responsibility deal, whereby he made the alcohol and food industries responsible for reducing alcohol consumption and improving nutrition, respectively. As a result, salt reduction lost momentum. Most of the foods that industry currently provide are very high in salt, fat, and sugars and are therefore more likely to cause cardiovascular disease and predispose to cancer than healthier alternatives. The UK’s salt reduction programme…led to a significant reduction in population salt intake, accompanied by reductions in blood pressure and cardiovascular mortality. The programme has been set back by the coalition government’s decision to hand power back to the food industry as part of the responsibility deal. An independent agency for nutrition with a transparent monitoring programme is urgently needed to improve the food that we eat. Members of the food industry have said that they are keen to reformulate their foods to make them healthier. All they require is to be on a “level playing field” with the other major companies, so that they can make their foods healthier in a structured, incremental way. They need to be assured that there are proper reporting mechanisms in place and that all of the companies are being monitored equally. Enforcement is required, and if it doesn’t work, regulation or legislation must be enacted. The debates over salt may be the most contentious in the field of nutrition (as the Washington Post puts it), but the parallels between the British decline in salt intake and in salt-related disease are impressive. On a population basis, eating less salt is healthier. This is something you can’t easily do on your own. The food industry has to do it. And food companies don’t want to, for obvious reasons. Hence: the need for regulation. Why regulate? Because it works. JAMA Pediatrics has just published the online version of a study by Daniel Taber et al, Association Between State Laws Governing School Meal Nutrition Content and Student Weight Status: Implications for New USDA School Meal Standards. I wrote the accompanying editorial: School meals: A starting point for countering childhood obesity. In it, I review how researchers like Taber et al are demonstrating how regulations aimed at changing the environment of food choice seem to be helping children and adults eat more healthfully. That is why regulation is worth consideration. The food industry cannot make significant changes on its own. Food companies are beholden to stockholders and returns to investors. We can’t count on consumer demand. It’s up against the billions of dollars spent on food marketing, advertising, and lobbying. It’s government’s role to level the playing field. Studies like this one are beginning to show positive results. If you take junk food and sodas out of schools, kids don’t eat as much of them and are healthier. If you have strict nutrition standards for school food, the food is healthier and so are the kids. This may all seem self-evident, but now we have research to prove it. Government agencies should pay close attention and figure out everything they can do to make the food environment healthier for children and adults. I’m also catching up on reading. Wenonah Hauter. Foodopoly: The Battle Over the Future of Food and Farming in America. The New Press, 2012. Hauter heads up Food and Water Watch, a tough-minded advocacy group in Washington DC working to preserve and ensure a safe, accessible, and sustainable food supply. Foodpoly is her manifesto. She has a lot to say about the problems with food policy, food chains, the organic-industrial complex, the food safety system, factory farms, and corporate control of the food supply. She urges: “eat and act your politics.” I’m using it as required reading in my food advocacy course this spring at NYU. Bee Wilson, Consider the Fork: A History of How We Cook and Eat, Basic Books, 2012. Consider the Fork is a terrific delve into the history and modern use of kitchen tools so familiar that we take them for granted and never give them a thought. Bee Wilson places kitchen gadgets in their rich cultural context. I, for one, will never think about spoons, measuring cupts, eggbeaters, or chopsticks in the same way again. W.A. Bogart, Permit But Discourage: Regulating Excessive Consumption, Oxford University Press, 2011. Permit But Discourage is an engagingly written examination of a hugely important question: How can laws best be used to protect individuals and societies against out-of-control consumption of such things as alcohol, junk foods, sodas, and other unhealthy indulgences, without doing more harm than good? The book clearly and compellingly argues for a mix of laws that permit consumption but discourage excesses, and for finding that mix through trial and error. This fascinating book is as must read for anyone who cares about promoting health as well as human rights in a market-driven economy. Today’s debate: The Wall Street Journal asks who’s responsible for preventing obesity? Betsy McKay of The Wall Street Journal organized and moderated a debate on this question. I was a participant along with Brian Wansink , the John S. Dyson professor of marketing at Cornell University and Michael D. Tanner, senior fellow at the Cato Institute. The debate is lengthy—you can read all of it online—but here are my initial responses to the two questions asked of me. WSJ: What role should government play in addressing the obesity epidemic? DR. NESTLE: The government is up to its ears in policies that promote obesity. To name only a handful: supporting production of food commodities, but not of fruits and vegetables; permitting food and beverage companies to deduct marketing expenses from taxes; permitting SNAP benefits [food stamps] to be used on any food, thereby encouraging food companies to market directly to low-income groups. Research on the prevalence of obesity shows that after decades of remaining at the same level, it began to increase sharply in the early 1980s. Our sense of personal responsibility did not change then. What did change was the food environment, transformed by food industry imperatives to increase sales, to one that increasingly urged people to “eat more” by making it socially acceptable to eat anywhere, anytime, and in very large amounts. In this kind of food environment, all but the most mindful eaters overeat. Few of us are in that category. The food, beverage and restaurant industries collectively spend roughly $16 billion a year to promote sales through advertising agencies, perhaps $2 billion of that targeted at children. Marketing to children is well established to encourage kids to want advertised products, pester their parents for them, and believe that those products are what they are supposed to be eating. The “I am responsible” argument does not work for children (I’m not aware of evidence that it works well for adults either). Because regular consumption of junk foods and sugary drinks is linked to obesity in children, marketing these products to them is overtly unethical. To expect food and beverage companies, whose sole purpose is to increase sales and report growth in sales every quarter, to voluntarily stop marketing to children makes no sense. On ethical grounds alone, government intervention is essential. Given the personal and economic costs of obesity—currently estimated at $190 billion a year—governments have many reasons to promote the health of their populations. Just ask the military. WSJ: Let’s talk about some specific initiatives. 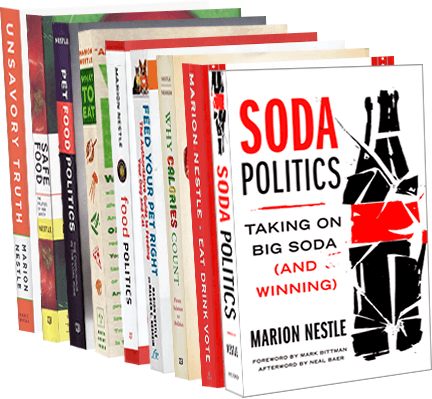 Will Mayor Bloomberg’s cap on soda sizes reduce soda consumption? What about the proposed municipal tax of a penny an ounce on sugary drinks in Richmond, Calif.? DR. NESTLE: If only education and personal responsibility worked to improve eating behavior. Brian Wansink’s research clearly shows that his own students, diligently educated to understand the effect of large food portions on eating behavior, will still eat more when given more food—and, more seriously, they will underestimate the amount they have eaten. Education must be backed up by a supportive environment. So why not create a food environment that makes it easier for people to eat less? Mayor Bloomberg’s idea of capping soda sizes at 16 ounces is an interesting approach to doing just that. A 16-ounce soda is not exactly abstemious. It is two standard servings, 50 grams of sugar and 200 calories. To suggest that food laws will not change behavior makes little sense. For one thing, anti-obesity initiatives have scarcely been tried. For another, the history of anti-smoking interventions suggests quite the opposite. Attempts to get smokers to quit by invoking personal responsibility made little headway. Smokers quit when the government made smoking so inconvenient and expensive that it became easier to stop than to continue. The intense response of soda companies to Mayor Bloomberg’s cap on soda size is testimony to the effectiveness of regulatory approaches. The companies would not be putting this kind of effort or spending millions to oppose an action they expected to fail. Obesity: global public health challenge or investment opportunity? Worried about the potential personal and economic costs of obesity? Never mind. It’s time to view obesity as a business opportunity. Increasing efforts to tackle obesity over the coming decades will form an important new investment theme for fund managers…Global obesity is a mega-investment theme for the next 25 years and beyond…The report…identifies that efforts to reduce obesity is a “megatrend” with a shelf-life of 25 to 50 years…BofA Merrill Lynch analysts across several sectors have collaborated to identify the sectors and companies developing long-term solutions. Pharmaceuticals and Health Care: companies taking advantage of the FDA’s increased support for obesity drug development; tackling related medical conditions and needs including diabetes, kidney failure, hip and knee implants; making equipment such as patient lifts, bigger beds and wider ambulance doors. Food: companies accessing the $663 billion “health and wellness” market and reformulating portfolios to respond to increasing pressure such as “fat taxes” to reduce sugar and fat levels. Commercial Weight Loss, Diet Management and Nutrition: companies pursuing dieting, nutrition and behavioral change—a $4 billion market in the U.S. and growing globally. Well, that’s one way to look at it. Public health, anyone? The third part of the PLoS Medicine series on Big Food (which I co-edited with David Stuckler) is now out. Happy Fourth of July! Pepsi is about to put 8,700 of its worldwide employees out of work. This might make you think the company is in trouble. Let’s have some fun with the numbers reported by Reuters in today’s New York Times. PepsiCo made $1.42 billion in profits last quarter. The company’s revenues, profits, and returns to investors are increasing. QED: it is adding 8,700 out-of-work people to an already depressed job economy. Ms. Nooyi has come under pressure from Wall Street for a stagnant stock price and a lagging North American beverage business. She has been criticized for taking her eye off the core business of sodas to expand into healthier products, such as hummus and drinkable oatmeal. When it comes to Wall Street, forget about jobs and health. Only one thing counts: meeting those quarterly growth targets. Advocates for a healthier food system should not expect much help from food corporations. They will only be able to help if forced to by public pressure and regulation.